I couldn't tell you the last time I slept in a tent...well, before last night! I admit, I was a bit hesitant...but work has been so hard for him, and I told myself that "whatever he wants to do, I'll do, without complaining" (that WAS the hard part), and when I came home from helping out at the Cassville Library (face painting for their "Breakfast with the Pokey Little Puppy") he had all the camping gear packed up, and was ready to go. We were going to just "go and see" if we wanted to stay and camp *duh* and of course, we did. It was beautiful. 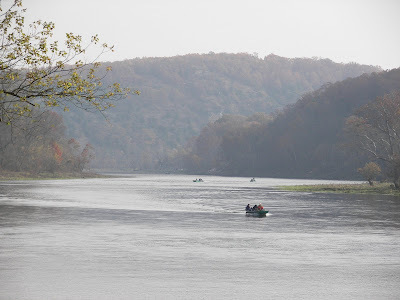 We went to the White River area that is near Bull Shoals Dam (and lake) and although it was sunny when we left home, it was overcast there, but still nice out. We had thought it was only a 20% chance of rain for today, but the woman in the camping office said that there was a 30% chance last night (and it rained lightly for a brief time this morning). 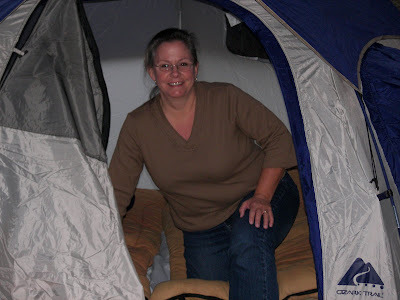 The new tent worked out great, and we didn't get cold in our OLD sleeping bags. The air mattresses were a REAL blessing (my back didn't hurt a bit!). 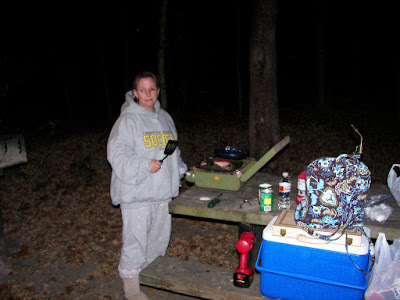 I woke up a few times, once to the sound of the kids playing on the other side of the campground, once to the sound of critters playing in a bag of candy we left out (on accident! ), and once to the sound of light sprinkles on the top of the tent (oh, i woke to Mark's snoring a few times too...but that's normal!) I had a bunch of weird dreams...one that Jason was camping with us, one that there was a possum in our tent (there was one by our campsite when we were at eating dinner)...funny things pop up in odd spaces like that. The river was beautiful, the fall color spectacular, and although it was actually a lot of work in a short trip, but it was worth it. I'm so glad that Mark talked me in to it. I'm ready to go again (although, only if the weather is as nice as it was this weekend!!). how fun spontaneous and romantic I hope you all enjoyed each other as much as the great outdoors.